In honour of an upcoming trip to Budapest I thought it was only right to get into the spirit of things with a warming, spicy goulash. I have used pork here but you can use beef if you prefer. Much like a lot of traditional recipes, there is no definitive goulash recipe but this is my take on it. I slow cooked this in the oven for 3 hours but you could do it in a slow cooker if you like. 1. Preheat the oven to 160c/ 140fan while you get cracking on the pork. Take a large casserole pan and heat a glug of oil over a medium to high heat. When the oil is hot, brown off the pork pieces a few at a time until sealed off and golden. Remove from the pan and set aside. 2. In the same pan, cook off the onion and garlic until softening. Next up goes the spices. I used a combination of smoked and hot paprika but you can adjust these to taste if you want a bit more heat. Goulash comes in a range of heats so play around! Cook the spices for a minute before adding the tomato puree for an additional minute. I also added a dried ancho chilli to give a fruity, smoked flavour which worked perfectly alongside the blend of spices. 3. 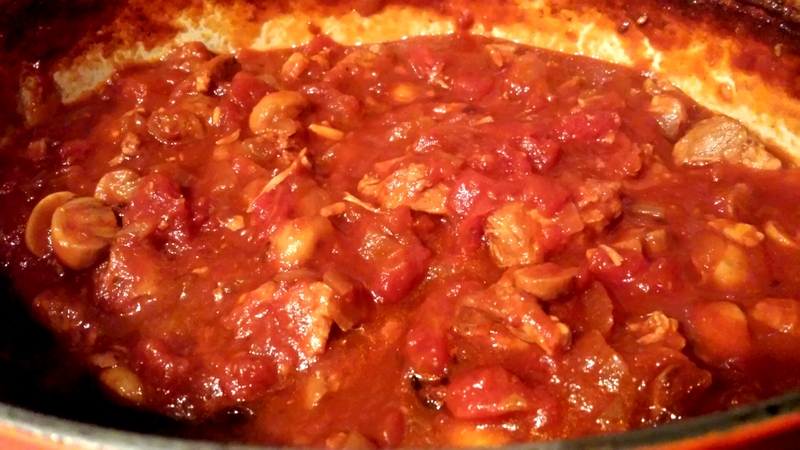 Add the pork back into the pan along with the mushroom, chopped tomatoes and stock. Bring to a gentle boil before popping in the oven for 3 hours. The pork is ready when it is tender and falls apart under gentle pressure. Serve with soured cream, sauerkraut and rice or potatoes. A Hungarian classic that will leave everyone Hungary for more!